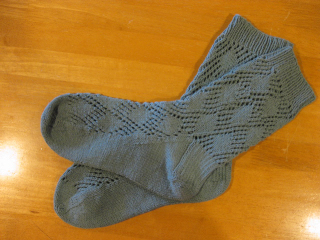 A couple of posts ago, I promised you photos of the socks I designed with Brown Sheep Cotton Fine. Before they went into the mail to live in Nebraska, I took a couple of photos. I call the pattern “Floating Islands” but I don’t know what the final name will be. 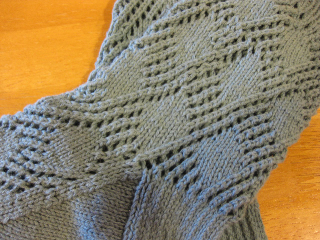 I really like the Cotton Fine – the stitch definition is really good and that makes a difference for lace. On another fiber front, I’ve been unofficially participating in the Tour de Fleece. I decided it would be an attainable goal to clean all the fleece in my house. Since I do it in small batches in the sink, it is a job that takes a lot of dedicated effort. Since it’s always much more fun to play with clean fiber than stick my hands into hot soapy water with greasy wool, I needed the extra incentive to get it done. I bought a 5 1/2 lb. Corriedale fleece last year at SAFF and I probably have 2 lbs left to wash. So far, I’ve done the amounts of white and brown Polworth fleeces I have; tomorrow should be the end of the roughly 6 oz. of silver-gray Polworth. I have to say – I haven’t even spun the fiber yet and I’m in love with it. The staple is so long and the crimp so fine, that by the time you get into the fineness of the individual fibers, it’s just ridiculously good stuff. I have a cunning plan to blend some angora with the brown Polworth. It should make the most divine fingerless gloves. If I can bear to give them away. Hm, I wonder if I have enough for two pair of mitts instead? Maybe I’ll make that my reward to getting back to the Corriedale. Such a nice fleece, but hard to get back to cleaning it after dealing with the coated Polworth. You can tell she’s a Southern sheep by all the red dirt!